Sweetpotato [Ipomoea batatas (L.) Lam] is a rich source of carbohydrates, vitamin A, vitamin C, fiber, and minerals (Woolfe 1992; Teow et al. 2007). It is one of the most affordable and nutrient rich among the root and tuber crops in the developing world, and it is particularly important in sub-Saharan Africa (SSA) (Low et al. 2007). The consumption of orange-fleshed varieties rich in β-carotene has been shown to improve the vitamin A status of children and women in SSA (van Jaarsveld et al. 2005; Hotz et al. 2012). This, coupled with its ability to yield under marginal soil conditions, with minimal input requirements makes sweetpotato a key crop in the food systems of many SSA countries (Karyeija et al. 1998). Despite the importance of the crop, average sweetpotato storage root yields in SSA are low, about 4.0–10.0 metric t/ha compared to the average root yield of 21.5 metric t/ha in China, the leading global producer of the crop (FAOSTAT 2014). Apart from poor crop management practices, a major reason for low storage root yields in SSA is due to sweetpotato weevil (SPW), which can cause complete yield losses during dry spells (Smit 1997). The sweetpotato weevil species, Cylas puncticollis (Boheman) and Cylas brunneus (Fabricius) predominantly occurring in Africa, severely reduce the production and market value of sweetpotato in SSA (Stathers et al. 2003). The major damage is inflicted on the storage roots by larval feeding (Cockerham et al. 1954; Jansson et al. 1987). Secondary pathogen infection and induction of sesquiterpenes produced in response to damage makes the storage roots bitter and unacceptable for consumption (Uritani et al. 1975; Sato and Uritani 1981). The concealed feeding behavior of SPWs makes their management difficult (Nottingham and Kays 2002; Odongo et al. 2003). Host plant resistance is a major component of any integrated pest management (IPM) program, but to date, the development of weevil resistant varieties has not been successful in SSA. This is attributed to the complex nature of the sweetpotato genome making crop improvement difficult, limited sources of resistance and lack of knowledge on the genetics of inheritance of sweetpotato weevil resistance even where resistance mechanisms have been identified (Stevenson et al. 2009). Recently, a wide range of sweetpotato genotypes were screened for SPW resistance and compared with a highly susceptible cultivar, I. batatas ‘Tanzania’, as a control to identify the biochemical basis of SPW resistance (Muyinza et al. 2012; Anyanga et al. 2013). Considerable variation in the concentrations of hydroxycinnamic acid (HCA) esters in the screened genotypes was recorded with the highest concentration observed in ‘New Kawogo’, an African landrace originating from Uganda. The six HCA esters associated with SPW resistance were identified as hexadecylcaffeic acid, hexadecylcoumaric acid, heptadecylcaffeic acid, octadecylcaffeic, octadecylcoumaric acid and 5-0-caffeoylquinic acids (Stevenson et al. 2009; Anyanga et al. 2013). Their constitutive production in sweetpotato, particularly at the root surface, was established as one of the quantifiable chemical bases of SPW resistance (Anyanga et al. 2013). Development of a rapid chemotyping method for hydroxycinnamic acid esters (HCA), and/or molecular markers linked to them was proposed in as a tool for selecting SPW resistance using marker-assisted selection (MAS) and/or biochemistry-assisted selection. Our knowledge on the inheritance of SPW resistance is limited. 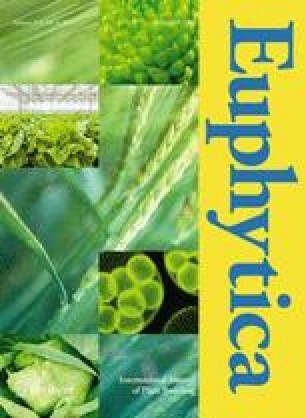 While linkage and QTL analysis of storage root yield, dry matter, starch, β-carotene content and root-knot nematode resistance have been reported in sweetpotato (Cervantes-Flores et al. 2008a, b; Chang et al. 2009; Cervantes-Flores et al. 2011; Zhao et al. 2013), none has yet been reported for SPW resistance. Development of biochemical and genomic tools to unravel the chemical and genetic basis of resistance to SPW in ‘New Kawogo’ will facilitate the development of SPW resistant germplasm and cultivars. The application of functional genomics in insect ecology has been widely reviewed by Tittiger (2004). Next-generation sequencing will also contribute to simple sequence repeat (SSR) and single nucleotide polymorphism (SNP) marker discovery for use in marker assisted selection (MAS) and genomic selection for developing SPW resistant cultivars. With the low number of sweetpotato SSR markers published to date compared to other major crops (Buteler et al. 1999; Hu et al. 2004; Schafleitner et al. 2010; Wang et al. 2011), and no SNPs at all, genomic improvement of SPW resistance is still in its infancy. In this study, we used logistic regression to associate published SSR markers (Buteler et al. 1999; Hu et al. 2004; Schafleitner et al. 2010; Wang et al. 2011) to SPW resistance in the ‘New Kawogo’ x ‘Beauregard’ bi-parental population, which is segregating for SPW resistance and other agronomic traits. This is the first time that co-dominantly inherited SSR markers have been used to identify SPW resistance loci in sweetpotato. As more sweetpotato SSR and SNP markers are developed, genomic SPW resistance breeding might be implemented in the future. The population used in this study consisted of 287 F1 progeny from a bi-parental cross between ‘New Kawogo’ (NK) and ‘Beauregard’ (B) generated at NaCRRI in Uganda (0°32′N, 32°35′E, 1150 m.a.s.l). ‘New Kawogo’ (female) is a moderately SPW and sweetpotato virus disease (SPVD) resistant, high dry matter content, white-fleshed released Ugandan cultivar (Mwanga et al. 2001; Stevenson et al. 2009). ‘Beauregard’ (male) is a SPW and SPVD susceptible, low dry matter content and orange-fleshed (high β-carotene content) US cultivar (Rolston et al. 1987). Genomic DNA was extracted from the young leaves (ca. 100 g) of each progeny and parents using a modified C-TAB method (Doyle and Doyle 1990) and quantified using a NanoDrop ND-1000 spectrophotometer (NanoDrop Technologies, Wilmington, Delaware) at the NaCRRI Biosciences laboratory. The DNA samples were then shipped to North Carolina State University for genotyping. The sequences of 405 published expressed sequence tags (EST) SSR primers (Buteler et al. 1999; Hu et al. 2004; Schafleitner et al. 2010; Wang et al. 2011) were obtained for this study. The primers were redesigned by addition of the M13 tail universal primer sequence (TGTAAAACGACGGCCAGT) to the 5′ end of the forward primer sequence and then synthesized by Eurofins Genomics (Huntsville, Alabama). The complementary M13 sequence was fluorescently labeled with VIC (green), 6FAM (blue), NED (yellow) and PET (red) tags from Applied Biosystems (Foster City, California) for automated detection of polymerase chain reaction (PCR) products. The genomic DNA was amplified using polymerase chain reaction (PCR) performed in a 10 µl reaction volume. The PCR reaction consisted of 3.0 µl (20–40 ng/µl) DNA template, 1.0 µl 10X PCR buffer, 1.0 µl 15 mM MgCl2, 0.8 µl 10 mM DNTPs mix, 0.2 µl forward primer (1.0 µM), 1.0 µl reverse primer (1.0 µM), 0.5 µl M13 primer (1.0 µM), 0.1 µl Taq polymerase (50 U/µl) and 2.4 µl PCR water. The PCR conditions were as follows; one hold at 94.0 °C for 4 min, followed by first 15 cycles of 94.0 °C denaturation for 30 s, 55.0 °C annealing for 30 s, and 72.0 °C extension for 1 min, then followed by 25 cycles of 94.0 °C for 30 s, 50.0 °C annealing for 30 s, and 72.0 °C extension for 1 s, followed by two holds at 72.0 °C for 7 min, and at 4.0 °C for infinite time. The PCR amplifications were performed using an Eppendorf Mastercycler (Eppendorf AG, Hamburg, Germany). We did PCR product sizing by capillary electrophoresis using an ABI3730xl Genetic Analyzer (Applied Biosystems, Foster City, California). The allele data was analyzed using GeneMarker 2.2.0 (SoftGenetics, State College, Pennsylvania). Allele scores were converted to binary data, with 1 being allele present and 0 as allele absent. Details of DNA extraction and PCR were described in Yada et al. (2015). The 287 progeny and parents were evaluated for SPW resistance at three sites and two seasons in Uganda during 2012–2013. All experiments were arranged in a randomized complete block design with 3 replications per genotype per site. Each experimental plot consisted of five plants spaced 30 cm apart planted on ridges separated by 1.0 m.
The trials were conducted at the National Semi-Arid Resources Research Institute (NaSARRI) (1°32′N, 33°27′ E), Ngetta Zonal Agricultural Research and Development Institute (NgeZARDI) (2°202′N, 33°62′ E), and the National Crops Resources Research Institute (NaCRRI) (0°32′N, 32°35′E). The trials were artificially infested with 20 weevils per plot (7 female and 3 male sweetpotato weevils each of C. puncticollis and C. brunneus) at 90 days after planting to increase the weevil population, and to optimize and even the infestation across the study sites as previously reported (Muyinza et al. 2012). The weevils were reared on storage roots in the laboratory at NaCRRI. During the first season (2012A), the trials were planted in June, 2012 and harvested in November, 2012. The second season trials (2012B) were planted in November, 2012 and harvested in May, 2013. The harvesting of both trials was done at 5-6 months after planting to allow ample time for SPW infestation. We inspected the harvested storage roots and scored SPW severity using a 1–9 scale, where 1 = no weevil damage symptoms, 2 = unclear weevil damage symptoms, 3 = clear weevil damage symptoms <5% of roots per plot, 4 = clear weevil damage symptoms at 6–15% of roots per plot, 5 = clear weevil damage symptoms at 16–33% of roots per plot, 6 = clear weevil damage symptoms in 34–66% of roots per plot (more than 1/3, less than 2/3), 7 = clear weevil damage symptoms in 67–99% of roots per plot (2/3 to almost all), 8 = clear weevil symptoms in all roots per plot, 9 = severe weevil damage symptoms in all roots per plot (rotting) as described in Grüneberg et al. (2010). Storage root samples were brought to NaCRRI and a sub-sample of storage roots from each plot was washed under running tap water and processed. We selected 289 genotypes (287 progeny and 2 parents) from NaCRRI and NgeZARDI for HCA analysis. Fresh roots were cut transversely into 2–3 root discs from the middle portion of each root sample, weighed and freeze-dried using a vacuum freeze dryer (True-Ten Industrial Co. Taichung City, Taiwan) for 72 h. The periderm and epidermal sections of the freeze-dried root disks were using the edge of a kitchen knife. The separated portions were powdered using a laboratory blender. The freeze-dried samples were weighed and milled at NaCRRI using a Thomas Wiley Mini-Mill (Thomas Scientific, Swedesboro, New Jersey). For HCA extraction, 50 mg of the powdered samples were immersed in methanol (1 ml) in 1.5 ml Eppendorf tubes for 24 h. The crude mixture was spun using a mini-centrifuge (BIO-RAD, Hercules, California) at 13,000 rpm for 5 min and the supernatant collected for liquid chromatography-mass spectrometry (LC–MS) analysis as described by Anyanga et al. (2013). The profiling of HCA ester concentration was done at the Natural Resources Institute (NRI), University of Greenwich, UK. All data analysis was performed using 284 progeny and the parents. Analysis of variance (ANOVA) of SPW resistance was conducted using the generalized linear mixed model procedure, PROC GLIMMIX (SAS 9.4, SAS Institute, Cary, North Carolina). We treated the genotypes as fixed effects and block, site and season as random effects. We compared the overall SPW least significant (LS) means of parents to that of progeny (Gtype), and also the individual progeny and parents LS means Gen (Gtype) across sites and seasons using the Turkey-Kramer grouping (α = 0.05). The genotype means were used to assess the level of transgressive segregation for SPW resistance. Using PROC MIXED and PROC IML (SAS 9.4, SAS Institute, Cary, North Carolina), we analyzed the phenotypic and genotypic variances for SPW severity scores, which were later used to compute the broad sense heritability of SPW resistance in this population. For total storage root HCA ester concentration, analysis of variance was done using PROC GLM with sites as replications. We used the genotype LS means for assessing the level of transgressive segregation for HCA ester production in the population. The Pearson correlation analysis of field SPW severity and HCA ester production of genotypes was done through PROC CORR (SAS 9.4, SAS Institute, Cary, North Carolina). For marker and trait association analyses, we used a total of 133 informative SSR markers out of the 405 markers screened. The SSR markers associated with SPW resistance were identified using regression analysis. We used the genotype best linear unbiased predictions (BLUPs) of SPW resistance and HCA content to identify SSR markers associated with sweetpotato weevil resistance. The genotype SPW resistance BLUPs were analyzed using PROC MIXED (SAS 9.4, SAS Institute, Cary, North Carolina). Then SSR loci and trait regression analysis was conducted using PROC GLIMMIX with genotypes as fixed effects. An SSR marker locus was considered to have significant association with SPW resistance if p < 0.05 for the regression analysis. Sites had significant effects (p < 0.05) on SPW resistance of the genotypes as the mean SPW severity at NaCRRI, NgeZARDI and NaSARRI were 3.6, 2.1 and 5.4, respectively. The genotype x environment (G x E) interaction effect was also significant for SPW resistance in this population. The mean SPW resistance of the parents compared to that of progeny (Gtype) as estimated by SPW severity scores on storage roots was not significant, but differences in mean SPW resistance of individual progeny and individual parents (Gen(Gtype)) across sites and seasons was significant (Table 1). The mean genotype SPW severity scores across seasons at NaCRRI ranged from 1.0 to 9.0, with a mean of 3.6 for both seasons (Fig. 1a), with mean SPW severity for ‘New Kawogo’ and ‘Beauregard’ of 2.1 and 7.5, respectively. A total of 18 progeny performed better than ‘New Kawogo’, the resistant parent for SPW resistance at NaCRRI. The top five most resistant progeny in terms of mean SPW severity at NaCRRI were; NKB84, NKB52, NKB280, KNB219 and NKB225. A total of three progeny: NKB217, NKB199 and NKB125 had higher severity scores than ‘Beauregard’, the susceptible parent at this site. At NgeZARDI, mean genotype SPW severity across seasons ranged from 1.0 to 7.0 (Fig. 1b) and the mean SPW severity across seasons was 2.1. The mean SPW severity of ‘New Kawogo’ and ‘Beauregard’ were 1.4 and 7.1, respectively. The distribution of genotype performance was skewed to the right, meaning most genotypes showed low SPW damage. Twenty-seven progeny exhibited positive transgressive segregation (performed better than the resistant parent) for filed SPW resistance at this site. The top five most resistant genotypes at this site were; NKB219, NKB225, NKB52, NKB72 and NKB115. No progeny had a higher mean SPW severity than ‘Beauregard’ at NgeZARDI. The mean genotype SPW severity scores across seasons at NaSARRI ranged from 2.0 to 9.0 (Fig. 1c) with a mean SPW severity of 5.4. The mean SPW severity of ‘New Kawogo’ and ‘Beauregard’ were 3.6 and 8.7, respectively. The total number of progeny exhibiting positive transgressive segregation for SPW resistance at NaSARRI was 19. The top five weevil resistant progeny at this site were; NKB219, NKB225, NKB260, NKB84 and NKB10. The progenies that performed worse than ‘Beauregard’ at this site were NKB17, NKB237, NKB283, NKB282 and NKB127. Mean overall genotype SPW severity across sites and seasons ranged from 1.0 to 8.0 (Fig. 1d). The mean overall SPW severity of the parents ‘New Kawogo’ and ‘Beauregard’ were 2.5 and 7.8, respectively. The overall genotype mean SPW severity distribution was skewed to the right and a total 25 progeny showed positive transgressive segregation for overall SPW resistance. Progeny NKB152, NKB257, NKB72, NKB59 and NKB260 had the lowest overall mean SPW severity across sites and seasons (most resistant). Progeny NKB219 and NKB225 had low mean SPW severity across the three sites having stable performance for SPW resistance. On analyzing the genotypic and phenotypic variances, the broad sense heritability estimate for field SPW resistance in this population was moderate (H2 = 0.49 ± 0.047). Mean storage root total HCA ester concentrations of genotypes (progeny and parents) were significantly different (P < 0.0001). The overall mean total HCA ester concentration of the genotypes was 69.4 ng/g on dry weight basis. The mean total HCA ester concentrations of ‘New Kawogo’ and ‘Beauregard’ were 379.6 and 70.4 ng/g, respectively. Genotype mean total HCA ester concentrations ranged from 4.9 to 379.6 ng/g, in progeny NKB175 and ‘New Kawogo’, respectively. The distribution of genotype mean total HCA ester concentration was skewed to the right and no progeny had higher total HCA ester concentration than ‘New Kawogo’, the resistant parent (Fig. 2). A weak significant positive correlation was observed between genotype total storage root HCA ester concentrations and field SPW severity (r = 0.103, P = 0.015). The top five progeny with the highest mean total HCA ester concentration were; NKB257 (366.5 ng/g), NKB152 (357.5 ng/g), NKB108 (268.9 ng/g), NKB256 (254.0 ng/g) and NKB265 (237.1 ng/g). In contrast, the progeny that showed the lowest concentration of mean total HCA esters were; NKB175 (4.9 ng/g), NKB285 (5.0 ng/g), NKB182 (6.3 ng/g), NKB29 (8.1 ng/g) and NKB223 (8.7 ng/g). Out of the top five best performing progeny for mean total HCA ester concentrations and SPW severities, three (NKB152, NKB257 and NKB108) showed high consistent performance on the basis of SPW severities. Out of the 25 progeny that performed better than ‘New Kawogo’ for field SPW resistance, nine had total HCA ester concentrations greater than 140 ng/g. Interestingly, some highly susceptible progeny to SPW in the field such as NKB80, NKB151 and NKB283 had high HCA ester concentrations of 163.9, 160.5 and 140.6 ng/g, respectively. Out of the 405 SSR markers screened, 250 were polymorphic on the parents and selected progeny. However, some of the polymorphic markers later gave ambiguous allele profiles and were discarded. This left 133 useful markers for marker trait association analyses. Marker and mean genotype SPW BLUPs regression analysis indicated that five out of the 133 SSR markers were significantly associated with field SPW resistance (Table 2). However, the variance (R2 values) explained by these markers was low. The most informative SSR marker was J116A, which explained 8% of the total variance in mean genotype SPW BLUPs. A total of seven SSR markers were significantly associated with mean storage root HCA ester concentrations in this population (Table 3). These markers explained 38.5% of the total variance in mean HCA ester concentration in the population. The most highly significantly associated SSR marker to HCA ester synthesis in this population was marker IbL10, which explained 7% of the total variance. SSR markers IBS11, IbE5 and IbJ544b were significantly associated with both HCA ester and field-based SPW resistance in this population. Sweetpotato weevil damage escalates in SSA sweetpotato fields during dry spells (Stathers et al. 2003). Our results are in agreement with this finding as NaSARRI, located in a semi-arid part of Uganda had the highest mean weevil severity. At NaSARRI, dry spells typically begin at the end of the each growing season and are characterized by high levels of soil cracks on the sweetpotato mounds and ridges as the storage roots mature. The soil cracks create entry avenues for gravid weevils to lay eggs in exposed storage roots, which then hatch into larvae, the most damaging stage of the SPW (Jansson et al. 1987). Severe damage by larvae occurs through concealed feeding within the storage roots. Another reason for SPW escalation during drought is the low amount of water in the soil. As a result, limited amount of water is absorbed and transported throughout the plants and the plants consequently dry up (Mao et al. 2004). Therefore, the translocation of plant defense phytochemicals throughout the plant is also inhibited due to the low amount of water flowing through the vascular tissues (Ni et al. 2009). The significant G x E interaction for SPW resistance observed in our study implies that genotypes should be tested at multiple sites for selecting SPW resistance. The genotypes (progeny and parents) in our study significantly differed in their mean weevil infestation across sites and seasons. Their published levels of SPW resistance informed our choice of the parental genotypes used in this study. ‘New Kawogo’ was reported to be moderately resistant and have high levels of plant chemicals conferring field resistance to SPW (Mwanga et al. 2001; Stevenson et al. 2009), whereas ‘Beauregard’ was reported to be highly susceptible to a host of insect pests including sweetpotato weevils (Rolston et al. 1987). Furthermore, we report here comparatively low levels of HCAs for ‘Beauregard’. We observed a range of field SPW resistance in this population. The large number of progeny showing transgressive segregation is attributed to the diverse nature of the parents selected from different gene pools. Grüneberg et al. (2009) reported that progeny generated from diverse parents from wide gene pools exhibited high levels of diversity and heterosis for key agronomic traits in sweetpotato. Progeny that performed better than ‘New Kawogo’ and had storage root yield have become potential candidates for yield trials and use as sources of genes for future population improvement. A moderately high level of genetic diversity was observed in this population (Yada et al. 2015), which supports the observation of the large number of progeny exhibiting transgressive segregation for SPW resistance. The significant differences in the concentrations of mean total HCA esters among the genotypes could be attributed to random re-assortment of alleles at multiple loci for this trait in this cross. ‘New Kawogo’ (female) was reported to have high concentrations of total HCA esters and high levels of field resistance to SPW (Stevenson et al. 2009; Anyanga et al. 2013). Total HCA esters were reported to have a significant effect on the mortality of sweetpotato weevils in a controlled laboratory experiment on treated artificial diet in a dose dependent response, which is the reason they were hypothesized to be the chemical basis of active and quantifiable SPW resistance in ‘New Kawogo’ (Stevenson et al. 2009). The highly skewed distribution of mean HCA ester concentration of genotypes to the right with a mean genotype HCA ester concentration of 69.4 ng/g could be an indication of a rare allele that is qualitatively and recessively inherited. However, we cannot draw this conclusion with the sample size that was used in this study. Hydroxycinnamic acid esters have been shown to play key roles in the biosynthesis pathway of lignin, a key mode of plant defense against pathogenic attack and herbivory (Boerjan et al. 2003). Single genes were isolated and shown to encode the enzymes for lignin biosynthesis including hydroxycinnamate CoA ligase (4CL) in sugarcane (Ramos et al. 2001). The mode of inheritance of HCA esters in sweetpotato needs to be understood for enhancing their application in improving SPW resistance. A few clones including NKB152, NKB257, NKB108, NKB59 and NKB60, from our study showed consistently high levels of field and HCA ester-based weevil resistance. These clones could be candidate parental genotypes for use in population improvement for SPW resistance in SSA. We also observed clones that showed high levels of field resistance in terms of their weevil damage scores but contrarily had low HCA ester concentrations (e.g. NKB72, NKB225, NKB52, NKB158 and NKB279). The resistance in these particular clones could be attributed to other defense mechanisms than HCA synthesis such as: deep rooting, presence of physical morphological barriers (i.e., heavy pubescence) and quick healing mechanisms to insect wounding. These genotypes could have exhibited escape instead of active SPW resistance through mechanisms such as deep rooting. Varieties with deep rooting and heavy pubescence characteristics were reported to sustain low SPW damage in SSA (Stathers et al. 2003). The low field SPW damage in these genotypes could additionally have been attributed to presence of thick storage root cortex. Stathers et al. (2003) reported that, sweetpotato weevils less damaged genotypes with thick storage root cortex. Thick storage root cortex could lessen feeding as well as egg laying in weevils. It is noteworthy that some cultivars, for example ‘Ruddy’ (Bohac et al. 2002), ‘Regal’ (Jones et al. 1985) and ‘Sumor’ (Dukes et al. 1987), which are resistant to key insect pests, including the Wireworm-Diabrotica-Systena (WDS) complex and C. formicarius have been released in the US, though they have not become commercially important. To date, no SPW resistant cultivar has been bred and released in SSA despite the rigorous screening for SPW resistance in the global sweetpotato germplasm (Hahn and Leuschner 1981; Thompson et al. 1999; Yada et al. 2011; Jackson et al. 2012; Muyinza et al. 2012). Apart from the limited sources of SPW resistance for sweetpotato improvement in SSA, dual infestation by C. puncticollis and C. brunneus is another challenge to these efforts. The identification of progeny showing high levels of positive transgressive segregation resistance against both Cylas spp. could present a positive effort to address SPW damage in the region. From our study, the broad sense heritability of SPW resistance was moderate (H2 = 0.49), meaning a substantial amount of SPW resistance in this population is due to genetic variance. The inheritance of SPW resistance has been poorly studied. Thompson et al. (1994) in a set of half-sib families of 19 parental genotypes of varying levels of SPW resistance estimated the narrow sense heritability of SPW resistance through parent-offspring regression as 0.35 and 0.52 for number of damaged storage roots and percent of storage damaged roots, respectively. The moderate heritability estimate in our study means that selection of increased resistance is achievable, but future families for selecting weevil resistance should be generated from top performing progeny in this population. The limited number of SSR markers associated with field- and biochemistry-based SPW resistance in our study could be attributed to the moderate heritability of SPW in this population. This is the first time SSR markers are being associated with SPW resistance in sweetpotato to the best of our knowledge. This study has shown that, SSR loci for resistance to SPW occur in sweetpotato and can be used to enhance the improvement of sweetpotato for weevil resistance. The selected SSR markers could be used for genotyping germplasm and selecting diverse SPW resistant parents. However, there is need to identify QTL linked to resistance to SPW for use in sweetpotato improvement. Future sweetpotato improvement in SSA should exploit the use of HCA ester-based selection (chemotyping) augmented with field phenotyping and laboratory bioassays for long term population improvement. However, efforts to develop a low cost chemotyping platform using LC–MS are still too expensive. The calibration of near-infrared spectroscopy (NIRS) for analysis of total HCA ester concentrations in root samples would enhance throughput screening of breeding materials for population improvement in the region. This approach could be possible since fourier-infrared spectroscopy has already been successfully used for quantification of total hydroxycinnamic acid esters in forages (Allison et al. 2009). In conclusion, our study showed that SPW resistance is a heritable trait that can be mapped with SSR markers. More refined studies for estimating narrow sense heritability for SPW resistance are needed. Field resistance to SPW was significantly influenced by environment; as a result, we recommend further phenotyping of this population for SPW resistance. The positive transgressive segregates need to be screened further to confirm their level of SPW resistance for use in population improvement. Our data needs to be augmented with choice and no-choice feeding bioassay data on the genotypes to draw informed conclusions on the level of SPW resistance in this population. More genomic tools should be developed using the ‘New Kawogo’ x ‘Beauregard’ population through genotyping by sequencing of the entire population for SSR and single nucleotide polymorphism (SNP) marker mining. The McKnight Foundation Collaborative Crop Research Program (CCRP) and the Norman E. Borlaug Leadership Enhancement in Agriculture Program (LEAP) funded this research. Dr. Consuelo Arellano of the Department of Statistics, NCSU is acknowledged for providing guidance in statistical data analysis. We also thank the research staff at the various institutes for their support.